With this launch nearly every Indian mobile subscriber can book tickets from his mobile phone. SMS based booking will enable ticket bookings even from a mobile phone that does not have an internet or data connection. 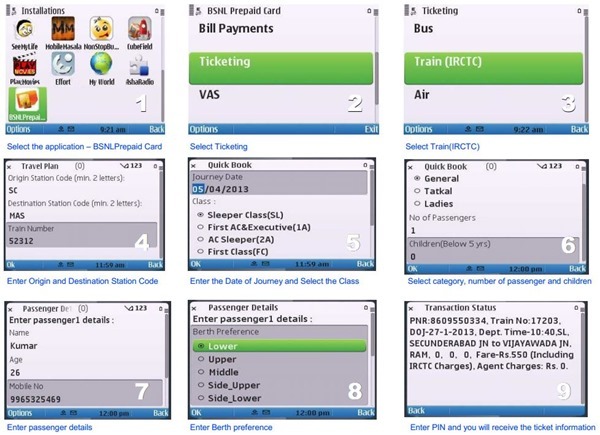 Along with simple text-messaging-based-SMS facility, IRCTC has also announced enabling ticket bookings through menu-based dialing service based on USSD. Currently the SMS Services are offered by 3 IRCTC Vendors –Bharat BPO, Frequency Weekly and Pyro Group, while USSD based services are offered by Airtel Money. Travelers will have to first register their Mobile number with IRCTC as well as with the Bank. Bank will then provide MMID (Mobile Money Identifier) & OTP (one time password) for authorization of payment. The mobile number will receive Transaction ID along with other booking details. To make payment for the booked ticket, user will again need to send following SMS to 139. You ticket gets booked once you send the above SMS Successfully. You will receive then receive a Transaction number. For making payment send an SMS in the following format. Charges: No PG Charges. Agent / IRCTC Service Charges: As applicable. SMSes @ Rs 3/- per SMS (2 SMSes are required for each booking). To book train tickets using BSNL, a user needs to have a BSNL SIM card installed, a Java enabled mobile phone and Andhra Bank Prepaid card. Charges: No PG Charges. Agent / IRCTC Service Charges: As applicable. SMSes without charges. Currently USSD based booking is available for Airtel Money subscribers only and here is the process. Register for Airtel money by dialing *400#. Enter mPIN for authorizing payment. Booking confirmation SMS is sent by IRCTC and same can be used during journey along with valid ID proof. Fare & IRCTC service charges are debited from your Airtel money account. There is no doubt that bookings via SMS is big, because it brings over 500 million mobile subscribers under the fold, who get an easy and quick channel to book tickets. However, it is not as straightforward as sending an SMS. For making payments, the users will still need to register with a Bank or a mobile wallet company or need to be a subscriber of either BSNL or Airtel. Having said that, it is a great initiative by IRCTC and kudos to them for taking this step. We will now have to wait and watch to see how many people actually use this service. And even after they use, how many successful transactions happen through SMS and USSD based transactions. I have my doubts. "How To Book IRCTC Train Ticket Thru SMS [Complete Process]", 5 out of 5 based on 1 ratings. can i book ticket for my friend and can i forward that sms means is that possible?? The no. for booking through SMS using mWallet (ZipCash) is 5676714 and not 5676717 as mentioned in your write up above. Thanks Rajesh for the update… We will make necessary changes to the article..